As the second largest country by land mass in South America, Argentina has a lot to offer the traveler, especially the over-lander. From the isolation and dramatic scenery of Southern Patagonia, or the bluest blue lakes of the Neuquén, to the stunning red earthy landscapes of the Andean North-West. There is many vast lands to discover. 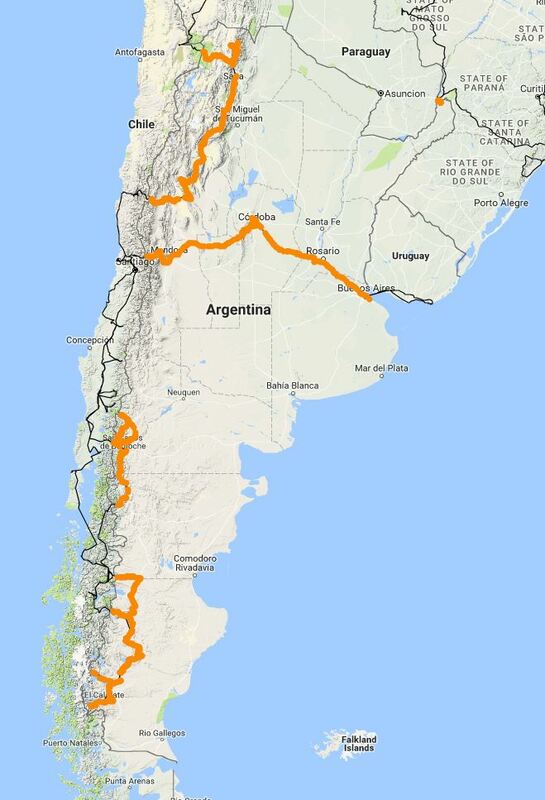 Mix that with different cultures and you’ll never be short of a smile whilst you motorcycle up and down Argentina. Money	 The Argentinan peso is in crisis (2017). Inflation is high and obtaining Pesos from ATMs is difficult. Cards are only accepted in Major cities. Bring USD from outside Argentina and exchange to Pesos at high end hotels and Casinos (at a better rate than xe.com). Most banks charge 98 pesos as a fee to get any amount of cash out and the ATM will most likely be out of cash anyway. Cards (mostly VISA) are excepted at fuel stations. If heading to remote places of Argentina, try and have some spare reserves of Pesos. Some towns around Patagonia for example have limited ATMs. Accommodation	 Accommodation options are plenty in Argentina. Hotels, Hostels, Couch-surfing and wild camping (outside main cities of course). However, hostels and hostels are more expensive than neighboring countries in South America. Food	 The Argentinean famous 'Asado' (Grilled meat) was ok. the quality of the meat was not great as it is custom here to eat all parts, so expect alot of fat in the meat. The rest is very greasy pizza with waaay too much cheese and fried food. Motorbike Parts (Availability, cost of Adv Bikes Parts)	 Parts / Oil are horrendously expensive. Expect to pay 4 times the price compared to USA / Europe. If you need tyres or parts, your best bet is to buy parts etc in neighboring Chile. English speakers are common in the bigger cities and tourist places like El Chalten and El Calafate. Argentina is relatively ‘safe’, see my post on safety in the Americas. Big cities have areas that should be avoided. Any seasoned traveler will have a sense of these areas and should avoid flashing expensive items around. Theft/Pick Pocketing is common in Buenos Aires.